This topic explains how to apply the latest platform release to your Microsoft Dynamics 365 for Finance and Operations environment. Finance and Operations platform binaries such as Application Object Server (AOS), the data management framework, the reporting and business intelligence (BI) framework, development tools, and analytics services. To move to the latest Finance and Operations platform, your Finance and Operations implementation cannot have any customizations (overlayering) of any of the AOT packages that belong to the platform. This restriction was introduced in Platform update 3, so that seamless continuous updates can be made to the platform. If you are running on a platform that is older than Platform update 3, see the section Upgrading to Platform update 3 from an earlier build section at the end of this topic. The following illustration shows the overall process for upgrading the Finance and Operations platform to the latest update. If you are already running on platform update 4 or later, updating the Finance and Operations platform to the latest release is a simple servicing operation. Once the platform update package is in your LCS asset library, follow the flow to apply an update from the LCS environment page: Select Apply updates under Maintain then select the platform update package. Learn how to get the latest platform package and apply it to an environment deployed through LCS in the next section. There are two ways to get the latest platform update package in LCS from your environment page. Click the All Binary Updates tile to see a list of combined package of application and platform binary updates. (As of Platform update 4, binary updates from LCS include an upgrade to the latest platform). Tiles on an environment's page in LCS show only the updates that are applicable to your environment based on the current version and state of the environment. Get the latest platform update package by clicking on one of the two tiles as mentioned above. After reviewing the fixes included in the platform, click Save Package to save the package to the project asset library. From a process perspective, deploying a platform upgrade package resembles a binary hotfix deployable package. 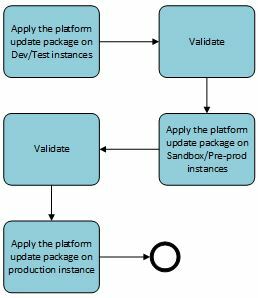 To apply a platform update package to your cloud development, build, demo, tier-2 sandbox, or production environment, update directly from LCS. For more details, follow the instructions for applying a binary hotfix in Apply a deployable package. Migrate files for Document management: After upgrading to Platform update 6 or later, an administrator needs to click the Migrate Files button on the Document management parameters page to finish the upgrade process. This will migrate any attachments stored in the database to blob storage. The migration will run as a batch process and could take a long time, depending on the number and size of the files being moved from the database into Azure blob storage. The attachments will continue to be available to users while the migration process is running, so there should be no noticeable effects from the migration. To check if the batch process is still running, look for the Migrate files stored in the database to blob storage process on the Batch jobs page. 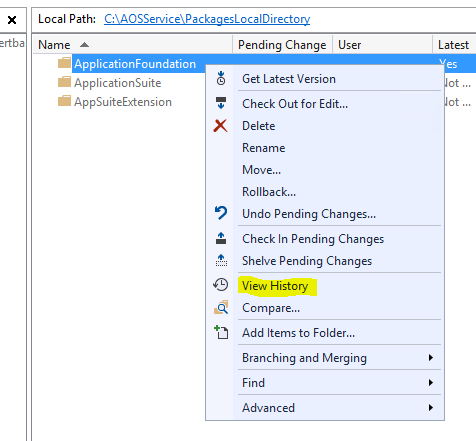 This section describes how to apply a platform update package to a local development environment (one that that is not connected to LCS). Go to your LCS project's Asset library. On the Software deployable package tab, click Import to create a reference to the platform update package. Select the desired platform update package. The package in the Shared Asset library may not correspond to the latest build (with hotfixes) of the desired platform release. To guarrantee the latest build, use the LCS environment page as described earlier in this article. These instructions apply only to environments that cannot be updated directly from LCS. Download the platform update package (AXPlatformUpdate.zip) to your virtual machine (VM). Unzip the contents to a local directory. Depending on the type of environment that you're upgrading, open the PlatformUpdatePackages.Config file under \AOSService\Scripts, and change the MetaPackage value. If you're upgrading a development or demo environment that contains source code, change the MetaPackage value to dynamicsax-meta-platform-development. If you're upgrading a runtime environment, such as a tier-2 sandbox environment or another environment that doesn't contain source code, the default value, dynamicsax-meta-platform-runtime, is correct. Step 3 is not applicable when upgrading to platform update 4 or later. Follow the instructions for installing a deployable package. See Install a deployable package. If you're working in a development environment, rebuild your application’s code. AXUpdateInstaller.exe generate -runbookid="OneBoxDev" -topologyfile="DefaultTopologyData.xml" -servicemodelfile="DefaultServiceModelData.xml" -runbookfile="OneBoxDev-runbook.xml"
Skip this section if you are updating to platform update 4 or later, development tools are automatically installed as part of installing the deployable package. Update the Visual Studio development tools as described in Updating the Visual Studio development tools. The following examples show how to generate the form adaptor models. Skip this section if you are updating to platform update 4 or newer, the data management service is automatically installed as part of installing the deployable package. After the deployable package is installed, follow these instructions to install the new Data Management service. Open a Command Prompt window as an administrator, and run the following commands from the .\DIXFService\Scripts folder. If you're connected to Microsoft SQL Server Integration Services 2016 (13.0), run the following command. If you're connected to an earlier release of Microsoft SQL Server Integration Services, run the following command. Skip this section if you are updating to platform update 7 or newer. This was a pre-requesite step for build environments. If the build machine has been used for one or more builds, you should restore the metadata packages folder from the metadata backup folder before you upgrade the VM to a newer Dynamics 365 for Finance and Operations platform. You should then delete the metadata backup. These steps help ensure that the platform update will be applied on a clean environment. The next build process will then detect that no metadata backup exists and will automatically create a new one. This new metadata backup will include the updated platform. To determine whether a complete metadata backup exists, look for a BackupComplete.txt file in I:\DynamicsBackup\Packages (or C:\DynamicsBackup\Packages on a downloadable virtual hard disk [VHD]). If this file is present, a metadata backup exists, and the file will contain a timestamp that indicates when it was created. To restore the deployment's metadata packages folder from the metadata backup, open an elevated Windows PowerShell Command Prompt window, and run the following command. This command will run the same script that is used in the first step of the build process. If a complete metadata backup doesn't exist, the command will create a new backup. This command will also stop the Finance and Operations deployment services and Internet Information Services (IIS) before it restores the files from the metadata backup to the deployment's metadata packages folder. You should see output that resembles the following example. After the metadata backup has been restored, delete (or rename) the metadata backup folder (DynamicsBackup\Packages), so that it will no longer be found by the build process. After you've prepared your build environment for this update, apply the platform update package by using the same method that you use on other environments. It is no longer possible to overlayer platform models (Application Platform, Application Foundation, Test Essentials). The Directory model is no longer in platform, it has moved to the application in Finance and Operations release 1611. If you cannot remove over-layering from the Directory model, and you still want to upgrade, you will have to do a complete upgrade of the platform and the application (Finance and Operations version 1611) as described in Overview of moving to the latest update of Finance and Operations. This section is not relevant if you are already on Platform update 3 and updating to a newer platform. Before you install the new platform update, you must clean up your Microsoft Azure DevOps source control project. Remove any X++ or metadata hotfixes that you've installed on your existing platform. If you have any X++ or metadata hotfixes that are checked in to your Azure DevOps project for any of the following Microsoft models, delete them from your project by using the Microsoft Visual Studio Source Control Explorer. You can find these hotfixes by browsing the check-in history of these Microsoft models. For example, use Source Control Explorer to browse the check-in history of the Trunk\Main\Metadata\ApplicationFoundation\ApplicationFoundation folder, and delete all XML files that have been checked in to it.